Negative binomial regression is for modeling count variables, usually for over-dispersed count outcome variables. This page was updated using SPSS 19. Example 1. School administrators study the attendance behavior of high school juniors at two schools. 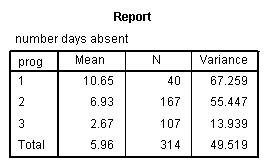 Predictors of the number of days of absence include the type of program in which the student is enrolled and a standardized test in math. Example 2. A health-related researcher is studying the number of hospital visits in past 12 months by senior citizens in a community based on the characteristics of the individuals and the types of health plans under which each one is covered. We have attendance data on 314 high school juniors from two urban high schools in the file https://stats.idre.ucla.edu/wp-content/uploads/2016/02/nb_data.sav. The response variable of interest is days absent, daysabs. The variable math is the standardized math score for each student. The variable prog is a three-level nominal variable indicating the type of instructional program in which the student is enrolled. Let’s look at the data. It is always a good idea to start with descriptive statistics and plots. descriptives variables = daysabs math. Each variable has 314 valid observations and their distributions seem quite reasonable. The unconditional mean of our outcome variable is much lower than its variance. Let’s continue with our description of the variables in this dataset. The table below shows the average numbers of days absent by program type and seems to suggest that program type is a good candidate for predicting the number of days absent, our outcome variable, because the mean value of the outcome appears to vary by prog. The variances within each level of prog are higher than the means within each level. These are the conditional means and variances. These differences suggest that over-dispersion is present and that a Negative Binomial model would be appropriate. Negative binomial regression – Negative binomial regression can be used for over-dispersed count data, that is when the conditional variance exceeds the conditional mean. It can be considered as a generalization of Poisson regression since it has the same mean structure as Poisson regression and it has an extra parameter to model the over-dispersion. If the conditional distribution of the outcome variable is over-dispersed, the confidence intervals for the Negative binomial regression are likely to be narrower as compared to those from a Poisson regression model. OLS regression – Count outcome variables are sometimes log-transformed and analyzed using OLS regression. Many issues arise with this approach, including loss of data due to undefined values generated by taking the log of zero (which is undefined), as well as the lack of capacity to model the dispersion. 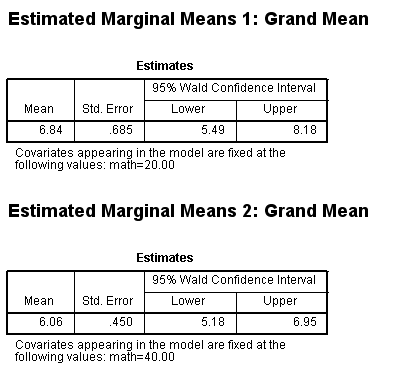 Below we use the genlin command to estimate a negative binomial regression model. We use the SPSS keyword by to indicate that the variable that follows is a categorical predictor, and we use the SPSS keyword with to indicate that the variable that follow is a continuous predictor. We use the (order = descending) option to use the first level of the variable prog as the reference group. On the model subcommand, we again list the predictor variables. We also indicate that the distribution to be used is negbin (negative binomial) and the link is a log link. By default, SPSS will not estimate the dispersion parameter. Because we wish for this to be estimated, we specified (MLE) after our distribution. SPSS provides many output tables, so we will interrupt the output to explain a few tables at a time. /model prog math distribution = negbin(MLE) link=log. 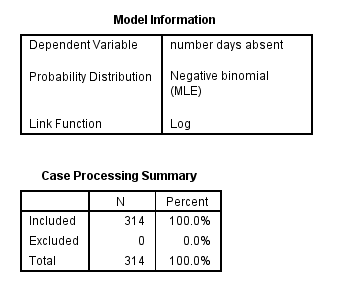 In the first two tables above, we see that the probability distribution used was negative binomial, the link function was log, and that all 314 cases were used in the analysis. We then see information on the distribution of the categorical predictor variable, as well as information on the distribution of the dependent variable and the continuous predictor variable. 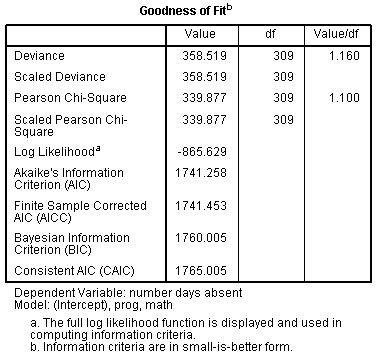 The table above provides several indices of the goodness of fit of the model. These measures can be used to compare models. The tables above provide tests of the model as a whole (Omnibus Test). The likelihood ratio chi-square provides a test of the overall model comparing this model to a model without any predictors (a "null" model). We can see that our model is a significant improvement over such a model by looking at the p-value of this test. 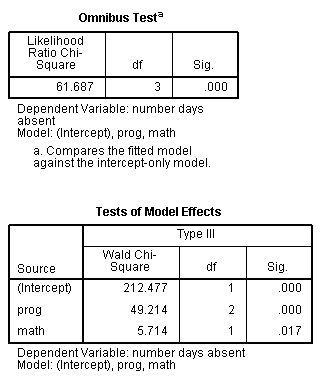 In the Tests of Model Effects table, we see that each of the predictors is statistically significant. The table includes the two degree of freedom test of prog, which indicates that as a whole, the variable prog is a significant predictor of dayabs. The table Parameter Estimates contains the negative binomial regression coefficients for each of the predictor variables along with their standard errors, Wald chi-square values, p-values and 95% confidence intervals for the coefficients. Both of the dummy variables for the variable prog are statistically significant. Compared to level 1 of prog, the expected log count for level 2 decreases by 0.44. Compared to level 1 of prog, the expected log count of 3.prog decreases by 1.28. The variable math has a coefficient of -0.006, which is statistically significant. 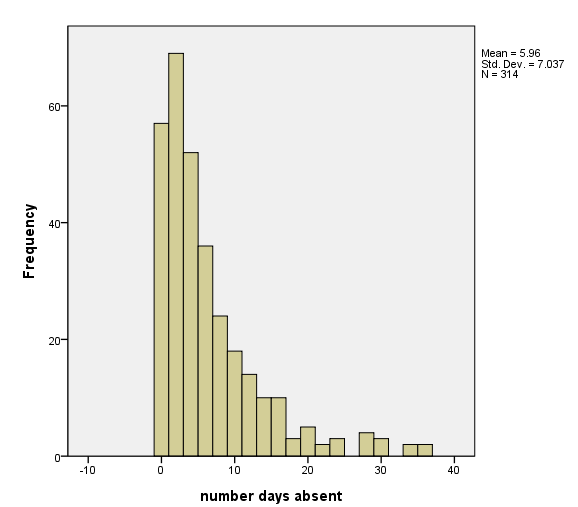 This means that for each one-unit increase on math, the expected log count of the number of days absent decreases by 0.006 day. Additionally, there is an estimate of the dispersion coefficient, (Negative binomial). A Poisson model is one in which this value is constrained to zero. In this example, the parameter’s 95% confidence interval does not include zero, suggesting that the negative binomial model form is more appropriate than the Poisson. An estimate greater than zero suggests over-dispersion (variance greater than mean). An estimate less than zero suggests under-dispersion, which is very rare. If you would like the results displayed as incident rate ratios, you can use the (exponentiated) option on the print subcommand after solution. Looking at the Exp(B) column in the table above indicates that the incident rate for prog=2 is 0.64 times the incident rate for the reference group (prog=1). Likewise, the incident rate for prog=3 is 0.28 times the incident rate for the reference group holding the other variables constant. The percent change in the incident rate of daysabs is a 1% decrease for every unit increase in math. log(daysabs) = Intercept + b1(prog=2) + b2(prog=3) + b3math. The coefficients have an additive effect in the log(y) scale and the IRR have a multiplicative effect in the y scale. The overdispersion parameter alpha in negative binomial regression does not effect the expected counts, but it does effect the estimated variance of the expected counts. For assistance in further understanding the model, we can use the emmeans subcommand. Below we use the emmeans subcommand to calculate the predicted number of events at each level of prog, holding all other variables (in this example, math) in the model at their means. /emmeans tables = prog scale = original. In the output above, we see that the predicted number of events (e.g., days absent) for level 1 of prog is about 10.24, holding math at its mean. The predicted number of events for level 2 of prog is lower at 6.59, and the predicted number of events for level 3 of prog is about 2.85. Below we will obtain the predicted number of events while holding math at 20, then 40. /emmeans control = math (40). The tables above show that with prog at its observed values and math held at 20 for all observations, the average predicted count (or average number of days absent) is about 6.84; when math = 40, the average predicted count is about 6.06. If we compare the predicted counts at any two levels of math, like math = 20 and math = 40, we can see that the ratio is (6.06/6.84) = 0.89. This matches the IRR of 0.994 for a 20 unit change: 0.994^20 = 0.89. You can graph the predicted number of events with the commands below. 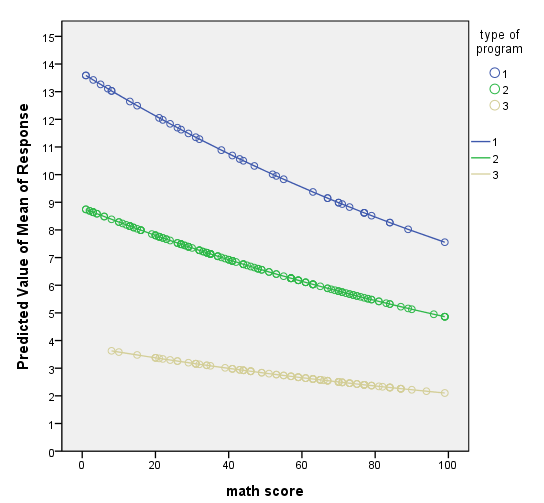 The graph indicates that the most awards are predicted for those in program type1, especially if the student has a high math score. The lowest number of predicted awards is for those students in program type 3. It is not recommended that negative binomial models be applied to small samples. Negative binomial models assume that only one process generates the data. If more than one process generates the data, then it is possible to have more 0s than expected by the negative binomial model; in this case, a zero-inflated model (either zero-inflated Poisson or zero-inflated negative binomial) may be more appropriate. Count data often have an exposure variable, which indicates the number of times the event could have happened. This variable should be incorporated into your negative binomial regression model with the use of the offset option on the model subcommand. Note that the offset is the natural log of the exposure. The outcome variable in a negative binomial regression cannot have negative numbers, and the exposure cannot have 0s. You will need to use the save subcommand to obtain the residuals to check other assumptions of the negative binomial model (see Cameron and Trivedi (1998) and Dupont (2002) for more information).